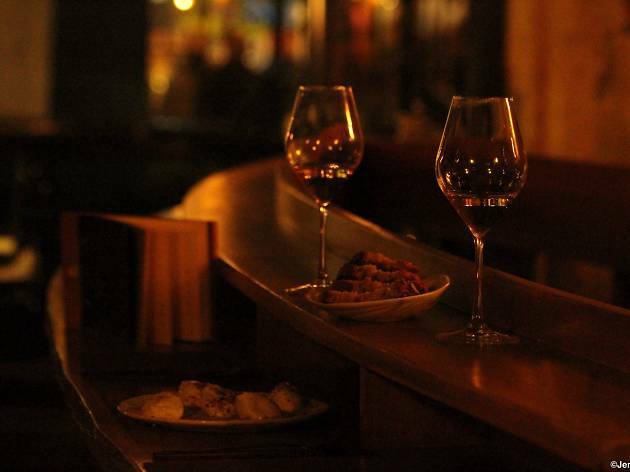 A funky little natural wine bar that stands out from the crowd in its neighbourhood. 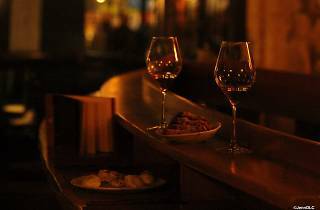 This sparky little natural wine bar near Odéon stands out in the upscale neighbourhood for being neither a tourist trap nor impossibly expensive. With its classy black frontage, small space done out in wood and exposed stone and funk soundtrack, it’s a classy proposition. All the wine served here is grown from organic grapes, then processed by hand and fermented without the aid of chemicals – giving those fashionable rustic vintages with a broad palette of flavours. There are 350 examples on offer, though no menu – so you have to put your trust in discussion with your server, making an evening here an exploratory, educational tasting. There is a menu for the food though, excellent charcuterie and tapas, each with a recommended wine pairing. The small space gets busy quickly, but the huge, boat-like central bar allows waiters to get to and from the cave at the rear and serve everyone as efficiently as possible. Just don’t overdo it and slip off one of the vertiginous bar stools.